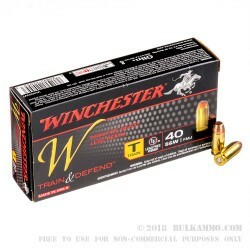 As one of the very ammo companies that helped to settle the western frontier, Winchester ammunition has a long and storied history of providing quality ammunition that never sacrifices performance for cost. The Winchester 180 grain 40 S&W Full Metal Jacket adds another solid round to the Winchester family of products, and is guaranteed not to disappoint. The Winchester 180 gr. 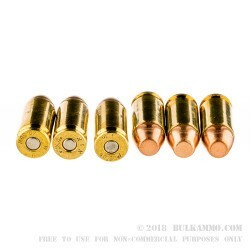 40 SW Full Metal Jacket uses only the finest of materials to craft one of the most accurate, and cleaning burning .40 calibers rounds anywhere on the range today. Precision measured propellants are encased in virgin brass, and ignited using the finest of boxer style primers. At a scathing muzzle velocity of 1,020 feet per second, the Winchester 180 gr .40 S&W FMJ hits hard, recoils light, and works inherently well in suprossor based applications due to the inherent subsonic nature of the round. 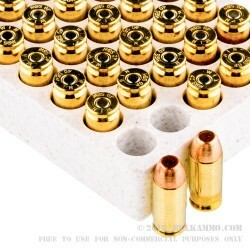 The semi wadcutter profile of the bullets face provide for a true crushing injury upon impact, and at a price even the most budget constrained shooters can afford, the Winchester 180gr .40 S&W Full Metal Jacket is one of the best rounds anywhere on the range today.